We’ve been on a little bit of a seafood binge lately. Between all the crab related dishes, and that bag of clams – I feel like we haven’t had a chance to have any landlubber favorites. So, when I came across this dish on Pinterest last week, I knew I couldn’t wait a whole week to make it – and rearranged my menu plans a bit to accommodate having this for dinner one evening. I have so many take-out favorites that I make here at home, but sweet & sour chicken was one that’d I’d not gotten around to trying out in my own kitchen. Which is surprising, because it’s one of our favorites to order. But so often it’s disappointing. The dreaded tub of orange sauce and some frozen breaded chicken pieces – and I just paid $8 for this? Ain’t nobody got time for that! The chicken pieces are lightly breaded in cornstarch (which is great for maintaining crispiness) and quickly fried. They are then layered with red and green peppers and fresh pineapple on a baking sheet, and doused with an awesome sweet and sour sauce that’s made from ingredients you probably already have in your pantry. The whole thing goes into the oven for a bit to finish up cooking and merry all those delicious flavors together. 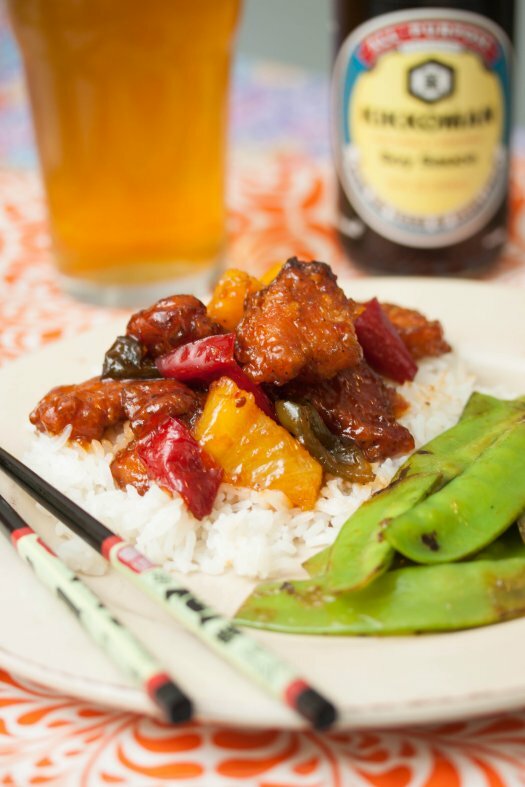 Served over a bed of rice, with a green vegetable – like snow peas or steamed broccoli, it’s a delicious dinner that you can feel good about serving to your family. And chances are, it also kicks the pants off of any sweet & sour chicken you’ve had in the past! Heat oven to 400 degrees. Place cornstarch in a shallow dish (I like to use pie plates) and place the beaten egg int another shallow dish. Season chicken with kosher salt and black pepper, and cut into 1-inch pieces. Dip each piece of chicken into the egg, and then into the cornstarch – moving around to cover the pieces completely. Heat the vegetable oil in a cast iron skillet (or another skillet with high-sided walls) over medium-high heat until shimmering. Add the chicken pieces on at a time, being careful to not overcrowd the pan. Fry, turning occasionally, until chicken is starting to brown. Remove chicken to a rimmed baking sheet lined with paper towels to drain while you fry the remainder of the chicken. Remove paper towels from under the chicken, and add the chopped peppers and pineapple to the baking sheet. To prepare the sauce, combine all the ingredients in a medium sized bowl and whisk well to combine. Pour about 3/4 of the sauce over the chicken, peppers, and pineapple. Gently toss to combine. Place in preheated oven and bake for about 40 minutes, until peppers are tender and sauce has thickened up and is starting to carmalize. Serve over rice with remaining sauce, if desired. God I love you. This will be great for first day of school dinner. Seriously, this is one of our favorite dishes when we eat out. It’s not in the recipe, but I added a splash on top of my portion. Love this! It’s my favorite take-out dish, but now I must make it at home! Delicious! I’ve been waiting to make this, and finally did. I always cut back on sugar in recipes, and I feel that if I would have used a cup and a half of sugar it would have been too sweet. Just a suggestion for those that don’t like things to sweet. Thank you for sharing your recipe, it was wonderful! !